The source code for this mod is included for personal use. Please do not publically modify or redistribute this mod without my permission. Credit goes to Bethesda, Kearsage's Classic Classes and Birthsigns (http://skyrim.nexusmods.com/mods/16736/), and icechamber's Natural Talents (http://skyrim.nexusmods.com/mods/18649/) for inspiring the ideas behind this mod. 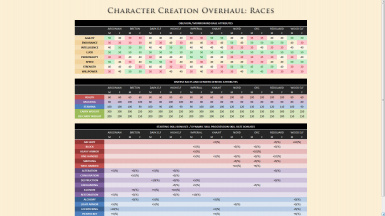 Thanks to the Unofficial Elder SCrolls Pages (http://www.uesp.net/) for the data on races and classes. Credit and BIG thanks to the following people: Sushisquid for making the automated installer script for NMM, powerbenny1706 for the German translation, Gennadiy for the Russian translation, jalmpitt for the Spanish translation, and taylortay2012 for the Chinese translation. If you enjoy this mod please Endorse/Vote for it! Featured on Skyrim Mods Weekly #20 (starts at 7:23)! 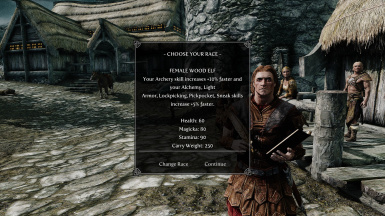 Vanilla Skyrim allowed any starting character, regardless of race or gender, to excel at virtually anything, taking out the fun, strategy, and role-playing aspects of previous Elder Scrolls games from the overall Skyrim experience. CCO makes races and genders diverse again, each with their own strengths and weaknesses, so that each play through will be noticeably different. For example, a male Orc will have more starting health and carrying capacity than a female High Elf, but the High Elf will have significantly more magicka. Starting health, magicka, stamina, and carry weight have all been carefully and formulaically derived from each race/gender's traditional attributes (e.g. Strength, Endurance, Intelligence, etc.) and then adjusted for balance in Skyrim. Additionally, (like in the previous Elder Scrolls game) all races' skills will start at level 5 before racial bonuses are applied. See the CCO Races chart for specifics. See the CCO Races chart for specifics. Choose the constellation (standing stone) you were born under when you create your character, just like in previous Elder Scrolls games. Optionally, you can choose to be born without a birthsign or change your standing stone later. Morrowind had 27 unique skills and allowed players to choose 5 major skills and 5 minor skills. 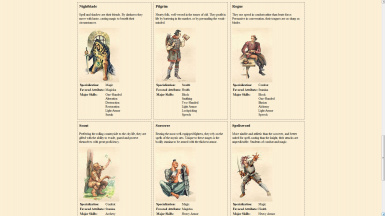 Oblivion had 21 unique skills and allowed players to choose 7 of them as major skills. 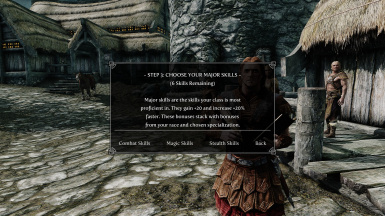 Skyrim only has 18 unique skills and thus only 3 can be chosen as major skills and 3 as minor skills. Oblivion allowed players to choose 2 favored attributes from Agility, Endurance, Intelligence, Luck, Personality, Speed, Strength, and Willpower. 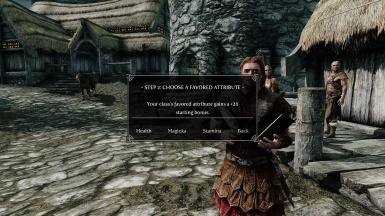 Since these base attributes no longer exist in Skyrim CCO allows you to choose 1 favored attribute from Health, Magicka, and Stamina. See the CCO Classes chart for full details. 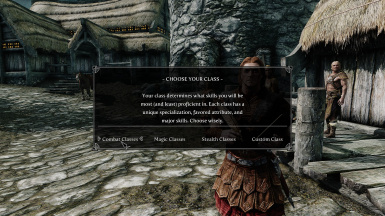 You can even create your own custom class and choose your own specialization, favored attribute, major skills, and minor skills. Each choice effects your character's starting skills and (optionally) their skill progression rates. Specialized skills in previous Elder Scrolls games progressed faster than non-specialized skills. In Skyrim, all skills progress at the same rate, making each character more adaptable, but also no different from any other character. CCO brings dynamic skill progression to Skyrim and improves upon it by having specialized skills, racial skills, and major skills all easier to learn (to varying degrees) while making untrained skills harder to learn. This feature is highly recommended but can be optionally disabled in-game. This mod is fully scripted and does not change any existing game records. 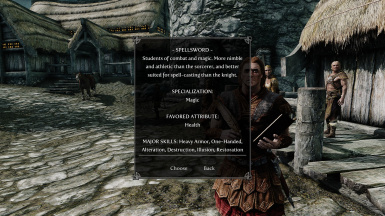 As such, it is technically compatible with all other mods, even alternate start mods and mods that make changes to races, abilities, perks, skills, etc. CCO will simply add its changes on top of any other installed mods. The only changes that will not stack are racial starting skill bonuses (skill rate changes still stack). For compatbility, any mod that adjusts racial starting skills will take precedence over CCO's racial starting skills. CCO is also compatible with SkyRe. Just download the qotsafan's SkyRe ReProccer Compatibility Patches for CCO. Thanks qotsafan! 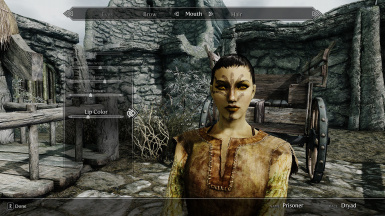 Download using Nexus Mod Manager or download manually and copy all files in the 'Data' folder to Skyrim's 'Data' folder then enable the 'Character Creation Overhaul.esp' file and any optional .esp's you may want to use. The optional .esp's should be loaded after the main .esp file, but otherwise load order does not matter. 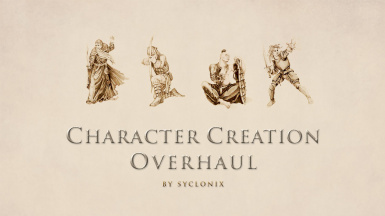 'Character Creation Overhaul.esp' (Required): This is the main .esp file. 'CCO - Diverse Races And Genders.esp' (Optional): Diversifies races and genders starting attributes. Highly recommended. 'CCO - Dynamic Skill Progression.esp' (Optional): Makes race and class skills easier to learn than untrained skills. Highly recommended. 'CCO - Uninstaller.esp' - This is the uninstaller. Do NOT activate this file unless you want to uninstall CCO. READ CAREFULLY: v1.4.0 Beta Features the new Major/Minor skill system. Install this on top of v1.3.X and SKIP THE INCOMPLETE "OPTIONAL TRAITS MENU" in game. Everything else is fully function. Works on existing games and can be uninstalled like normal. Do NOT perform a 'clean save' when upgrading. Just overwrite the old files and CCO will automatically upgrade itself. During the upgrade process, CCO will unapply the previous changes it made to your character and then ask you to reselect your class. CCO now comes with an automated uninstaller! Just open the book in your inventory called "A New Begining" and select "Destroy". Alternatively you can copy the 'CCO - Uninstaller.esp' located in the 'CCO Uninstaller' folder and activate it (do not deactivate the other CCO files). The next time you load your game it will unapply all the changes CCO made to your character. Then save your game and delete all the CCO related files from Skyrim's 'Data' folder. Any levels or skills you gained while using CCO will not be lost. Using CCO on existing characters may initially decrease some skills below the required level for perks that you have already obtained. These perks are still usable, but if you wish to remove them you will have to use a perk removal mod such as Ishs Respec Mod. When using the Dynamic Skill Progression module, racial skill rate bonuses are applied based on vanilla Skyrim races' starting skills, not based on other mod's. 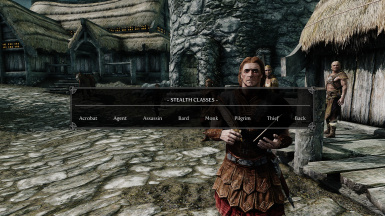 For example, if mod X gives Imperials a +10 starting skill bonus to Speech, you will not also receive a skill rate bonus to Speech since Imperials do not normally get a starting skill bonus in vanilla Skyrim. If you have mods that alter birthsigns, CCO will use those changes, but CCO's birthsign descriptions may not be accurate. NEW: Respec your character using the book "A New Begining"
NEW: Option to uninstall CCO in-game using the book "A New Begining"
CHANGED: Dynamic Skill Progression has been rebalanced. Removed -10% skill rate penalty for untrained skills and added +20% skill rate bonus for major skills. FIXED: Skill books bug where the Player was not given a skill level when reading skill books for untrained skills. Credit goes to Bethesda, Kearsage's Classic Classes and Birthsigns, and icechamber's Natural Talents for inspiring the ideas behind this mod. 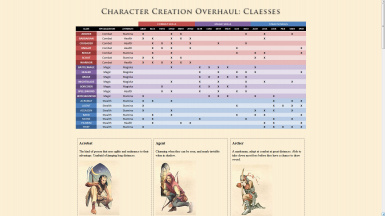 Thanks to the Unofficial Elder SCrolls Pages for the data on races and classes.